Syrian army soldiers celebrating in the Al-Madhaniya neighborhood after its takeover. 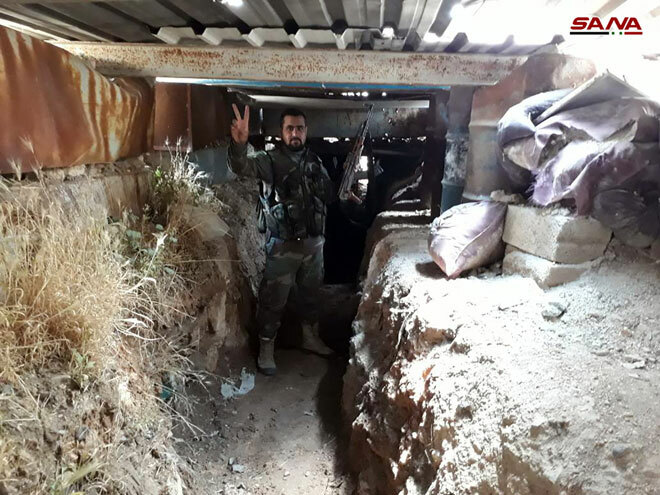 Syrian army soldier inside a fortified position in the Al-Asali neighborhood, in the southern part of the Al-Qadam neighborhood. 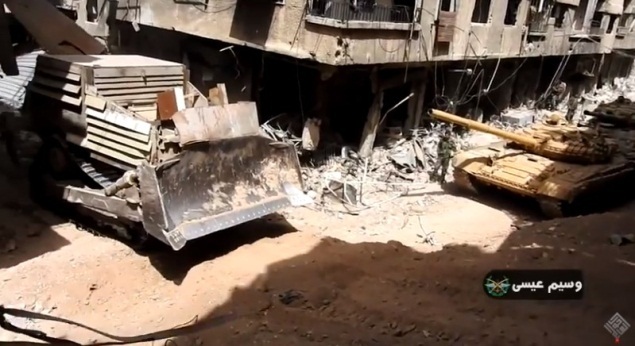 Bulldozer near Syrian army tanks in one of the streets in the Yarmouk refugee camp. 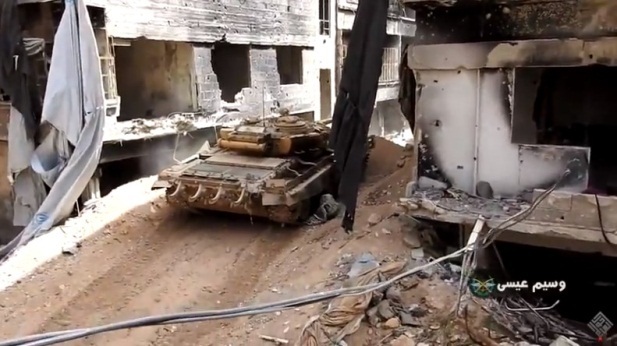 Syrian army tank in the Yarmouk refugee camp attacking ISIS targets after a bulldozer blazed a way for it to pass through an embankment (haol alaalam 24 YouTube Channel). 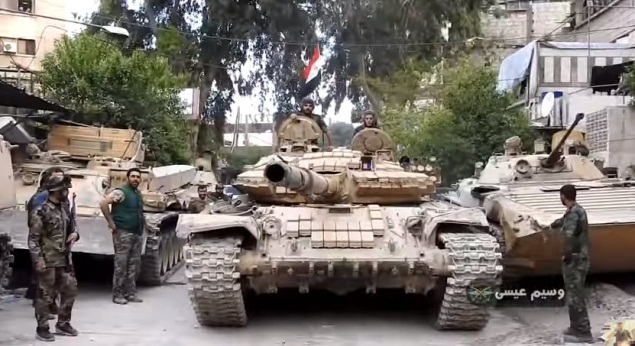 Tank of the Syrian army’s Republican Guard Brigade. This week, the Syrian army recorded achievements in its campaign to take over the southern suburbs of Damascus from ISIS. The Syrian army forces advanced inside the Yarmouk refugee camp and took control of most of the Al-Qadam neighborhood to its west. In addition, the Syrian army took control of part of the Al-Hajar Al-Aswad neighborhood, south of the Yarmouk refugee camp. The Syrian army’s advance is supported by artillery fire and airstrikes, causing civilian casualties (36 civilians have been killed since the beginning of the campaign). The operatives of the Headquarters for the Liberation of Al-Sham, a jihadi organization and one of ISIS’s rivals, began to leave the Yarmouk refugee camp for the Idlib region after reaching an evacuation agreement with the Syrian regime. In eastern Syria, the US-backed SDF launched an operation called “Island Storm.” Its goal is to mop up the border area between Syria and Iraq from the presence of ISIS operatives. Afghanistan continues to be the only arena where ISIS systematically initiates attacks against its opponents, in contrast to other countries where ISIS is on the defensive. This week, ISIS carried out a number of attacks, the most prominent of which was a double suicide bombing attack in the compound of the Afghan National Directorate of Security, which is a preferred target of ISIS. This elaborate attack was carried out in stages: first a suicide bomber blew himself up at the entrance to the compound. When journalists arrived to cover the incident, a second suicide bomber, posing as a photographer, blew himself up. Around 30 people were reportedly killed in the attack, nine of them media people. The Syrian army continues its campaign to take over the southern suburbs of Damascus held by ISIS, mainly the Yarmouk refugee camp. At this stage, it seems that the Syrian army has had quite a few achievements: According to the Syrian News Agency, ISIS has lost control of most of the Al-Qadam neighborhood (west of the Yarmouk refugee camp) and part of the Al-Hajar Al-Aswad neighborhood (south of the Yarmouk refugee camp). The Syrian army proceeds while using artillery bombardment and airstrikes against ISIS targets and routes by which ISIS and other organizations transfer operatives and supplies. The Syrian Observatory for Human Rights reported that since the beginning of the campaign, 36 civilians were killed, as well as at least 85 Syrian army soldiers and operatives of the militias supporting it, and 74 ISIS operatives (Syrian Observatory for Human Rights, April 29, 2018). The Al-Hajar Al-Aswad neighborhood, south of the Yarmouk refugee camp, is an important ISIS stronghold. The Syrian army entered the neighborhood on April 27, 2018, and advanced there using several routes at the same time. 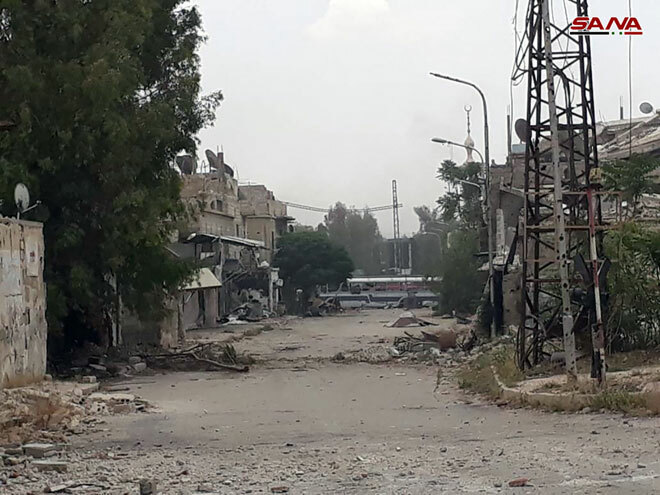 Due to the battles, families of ISIS operatives fled the neighborhood (and the Yarmouk refugee camp) to the villages of Yalda and Babila, east of the neighborhood. The Syrian forces attacked these supply and escape routes, and as a result, traffic and supplies from Al-Hajar Al-Aswad towards the east stopped (“Al-Yarmouk camp is in our hearts” Facebook page, April 27, 2018; Butulat Al-Jaysh Al-Suri, April 25, 2018). An agreement has reportedly been achieved to evacuate the rebel organizations’ operatives and the civilians from these two neighborhoods and from another neighborhood (Beit Sahm) to the areas of Idlib and Daraa (Mukhayyam Al-Yarmouk News, April 29, 2018). The Syrian army attacked ISIS operatives in the Yarmouk refugee camp while using bulldozers and tanks to blaze trails in the camp. On April 29, 2018, the Syrian army released a video showing a bulldozer and tanks of the Syrian army working in the refugee camp. The bulldozer was seen blazing a route for the tanks in the narrow streets and breaking through earth embankments to enable the tanks to pass through them and shell ISIS operatives in the camp (haol alaalam 24 YouTube Channel, April 29, 2018). On May 1, 2018, ISIS announced that its operatives had killed 30 Syrian soldiers who tried to advance to the outskirts of the Yarmouk refugee camp and to the Al-Hajar Al-Aswad neighborhood. ISIS released photos of the execution of a Syrian officer captured in the fighting (Haqq, May 1, 2018). 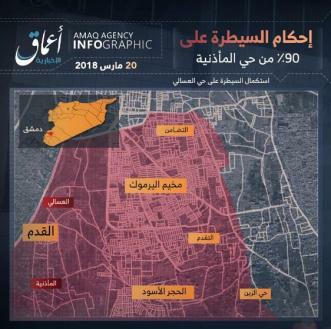 ISIS’s Amaq News Agency announced that the organization’s operatives had halted a Syrian army attack in the Al-Tadamon neighborhood (north of the Yarmouk refugee camp). ISIS also announced that 16 Syrian army soldiers had been killed by sniper fire in the fighting in the neighborhoods of south Damascus (Haqq, April 29, 2018). ISIS’s Damascus Province released a video entitled “The Muslims are [one] Camp”. The video documents fighting by ISIS operatives against the Syrian army and ISIS’s rival organization, the Headquarters for the Liberation of Al-Sham. 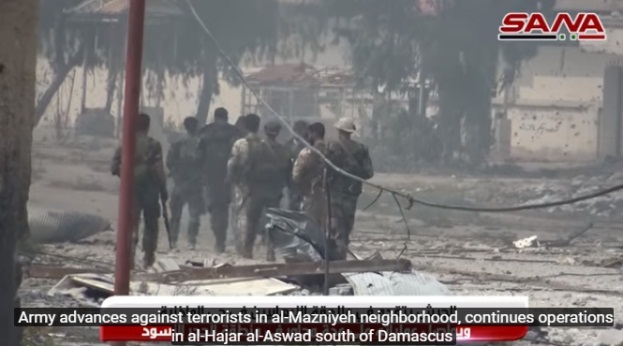 The video contains harsh criticism of the Headquarters for the Liberation of Al-Sham for evacuating areas in the neighborhoods south of Damascus and surrendering them to the Syrian regime instead of ISIS. The video calls on ISIS operatives to continue fighting while believing in their just cause. It also calls on all Muslims to join them (Haqq, April 28, 2018). According to Syrian TV, an agreement was reached, according to which operatives of the Headquarters for the Liberation of Al-Sham would be evacuated to Idlib in two stages. 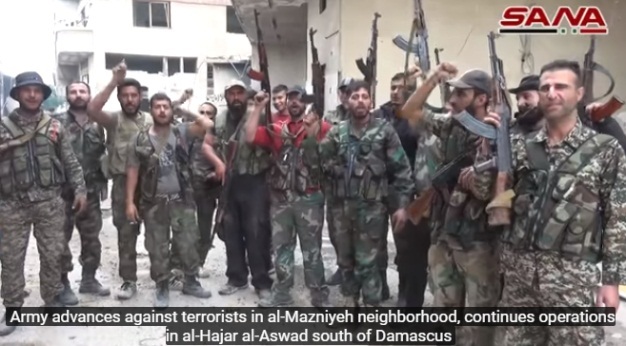 At the background of the agreement is the evident inferiority of the operatives of the Headquarters for the Liberation of Al-Sham in south Damascus against the Syrian army, and their reluctance to fight alongside ISIS (the organization’s relations with ISIS are still tense in spite of the Syrian army’s attack). The implementation of the evacuation agreement started on April 30, 2018. The evacuation agreement, as stated above, includes two phases: As part of the first phase, operatives of the Headquarters for the Liberation of Al-Sham will be evacuated from the Yarmouk refugee camp to Idlib. In return for this move, residents of the besieged Shiite villages of Kafraya and Al-Fu’ah (about 7 km northeast of Idlib) will be allowed to evacuate 1,200 inhabitants (out of about 5,000) from the villages. The rest of the besieged residents (about 3,500) will be evacuated in the second phase of the agreement. In addition, it was stipulated that 85 residents of the village of Ashtabraq, about 29 km southwest of Idlib (near Jisr Al-Shughur), would be returned to the Syrian army. 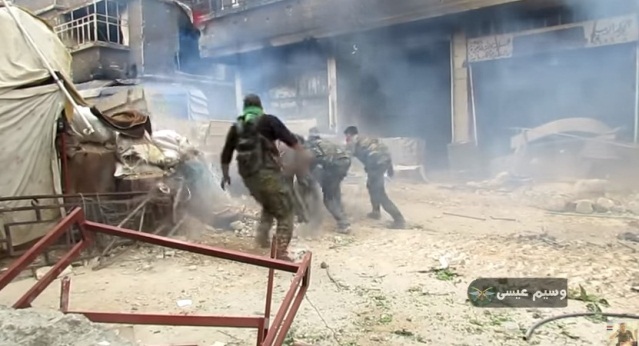 The village has been besieged by the rebel organizations (Syrian TV; SANA, April 29, 2018). The implementation of the agreement started on April 30, 2018. On that day, five buses with evacuees left the Yarmouk refugee camp. They included dozens of operatives of the Headquarters for the Liberation of Al-Sham (SANA, April 30, 2018). At the same time, dozens of buses entered the villages of Al-Fu’ah and Kafraya in order to evacuate about 1,500 residents (Al-Durar Al-Shamiya, April 30, 2018). In addition, 42 abductees were released from the village of Ashtabraq and transferred to the Aleppo area (Syrian Army Information Office, May 1, 2018). On April 29, 2018, the Guardians of the Religion Organization, which split off from the Headquarters for the Liberation of Al-Sham (formerly the Al-Nusra Front), announced its unification with the Supporters of the Oneness of Allah Organization. The name of the new organization is “The Alliance of Supporting Islam” (Enab Baladi, April 24, 2018). The Guardians of the Religion Organization, which is loyal to Al-Qaeda and regards itself as subordinate to Ayman al-Zawahiri. 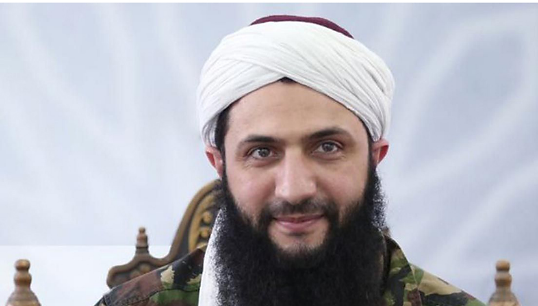 The organization was established in late February 2018, based on accusing Abu Mohammad al-Julani, leader of the Headquarters for the Liberation of Al-Sham, of conducting his own independent “Syrian” policy. In the ITIC’s assessment, the merger between the two organizations may somewhat strengthen the influence of the Al-Qaeda-affiliated jihadi organizations in the Idlib area. 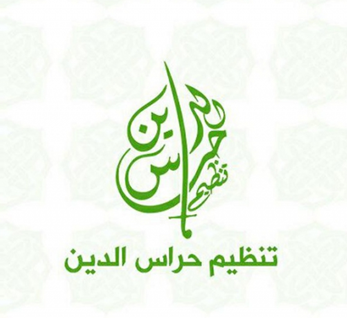 However, the ITIC believes that these jihadi organizations cannot pose a real challenge to the Headquarters for the Liberation of Al-Sham which, in the ITIC’s assessment, will remain the dominant organization among the rebel organizations operating in the Idlib area. 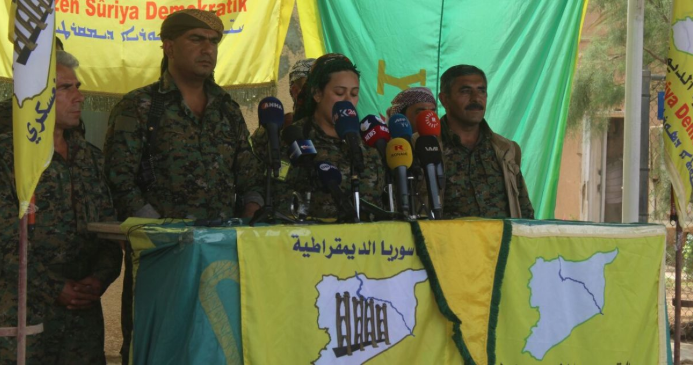 The Syrian Democratic Forces (SDF), operating with US support, announced the opening of Operation Island Storm. The operation’s goal is to remove ISIS’s presence from the border area between Iraq and Syria and mop up this region (the SDF website, May 1, 2018). At this stage, the ITIC does not have information on the operation’s progress on the ground. The Syrian army has recently taken over two villages held by ISIS on the east bank of the Euphrates River, several kilometers north of Deir ez-Zor. A few days earlier, a Russian force built a bridge connecting the two banks of the Euphrates. The bridge served the Syrian army to transfer equipment, weapons and military vehicles to the east bank of the Euphrates River (Qasiyoun, April 29, 2018; Rusiya Al-Youm, April 11, 2018). ISIS continues its attempts to disrupt the general elections in Iraq, scheduled for next month, so far, with no considerable success. This follows ISIS’s spokesman Abu Hassan al-Muhajir’s warning that the polling stations would be targeted by ISIS operatives. It can be assumed that as the elections approach, ISIS will enhance its efforts to disrupt them by terror operations. On April 27, 2018, ISIS’s Amaq News Agency released a video showing ISIS operatives shooting and killing two election campaign activists in the city of Al-Tamiriya (about 34 km north of Baghdad). 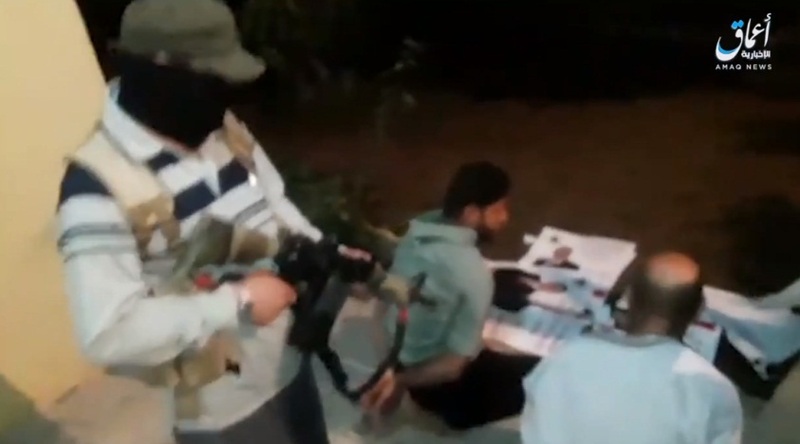 The video shows an ISIS operative pointing a gun at the two activists. They are seen bound, kneeling, with ads on behalf of election candidates placed in front of them. The operative says that he is acting based on what ISIS spokesman Abu al-Hassan al-Muhajir said (on the disruption of the elections). Afterwards, the two activists were shot to death (Haqq and a file-sharing website, April 28, 2018). Nineveh Province: Iraqi Military Intelligence personnel killed three ISIS operatives while they were carrying aid and food through the Tigris River to one of ISIS’s hideouts in Al-Qayyarah (about 60 km south of Mosul). In addition, a force of the Rapid Response Apparatus of the Nineveh police captured three ISIS operatives near Mosul’s northern neighborhoods (Iraqi News Agency, April 29, 2018). The city of Mosul: On April 29, 2018, a force of the emergency police in the Nineveh Province detained a senior ISIS operative on the east bank of the Euphrates River. The detainee is ISIS’s man in charge of security, who recently returned from Syria. Many weapons were found in his possession. He admitted forming two terror squads. In addition, ISIS’s man in charge of manufacturing weapons was captured in Mosul (Iraqi News Agency, April 22, 2018). 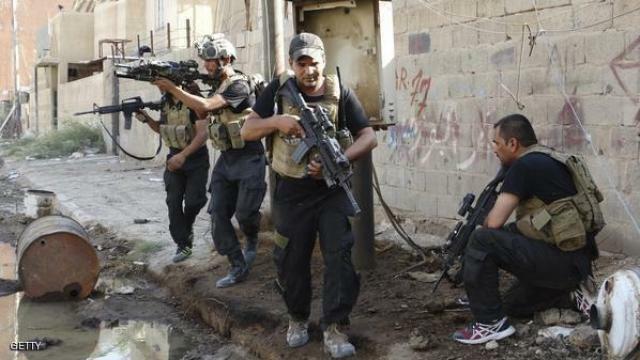 Al-Anbar Province: Al-Anbar’s Tribal Mobilization detained three senior ISIS operatives in the Rutba District, about 280 km west of Ramadi (Iraqi News Agency, April 28, 2018). The Egyptian Armed Forces’ General Headquarters released announcement no. 20 on the campaign against ISIS in Sinai (Sinai 2018, April 25, 2018). The announcement stated, among other things, that Nasser Abu Zaqul, ISIS’s emir in central Sinai, was eliminated. Dozens of ISIS operatives were killed, weapons were seized, IEDs were deactivated, and dozens of vehicles, including motorcycles, were confiscated. Saleh Nasser Fadhl al-Bakshi, Emir of ISIS’s Aden Province, was killed on April 28, 2018, in an exchange of fire with members of the Yemeni counterterrorism unit. Saleh al-Bakshi and other operatives barricaded themselves in a building in Aden. In the exchange of fire, a member of the counterterrorism unit was also killed. Three ISIS operatives were detained. According to a statement issued by the Aden police, Al-Bakshi was responsible for the deaths of hundreds of people, most of them members of the Yemeni security forces in the south of the country (Reuters, April 28, 2018). On April 30, 2018, ISIS carried out a double suicide bombing attack in the compound of the Afghan National Directorate of Security (NDS), a preferred target of ISIS. A first suicide bomber detonated an explosive vest that he was apparently wearing at the checkpoint in the entrance to the compound. Around half an hour later, when journalists and civilians reached the scene of the attack, a second suicide bomber blew himself up. According to Afghan Interior Ministry Spokesman Najib Danish, the second suicide bomber posed as a media man and blew himself up among a group of reporters and rescue teams. Around 30 people were killed in the attack and dozens were wounded. Nine of the dead were members of the media who came to cover the attack (Khaama Press; Reuters; AP, May 1, 2018). ISIS claimed responsibility for the attack, presenting a different version of what happened which, in the ITIC’s assessment, is false. According to the claim of responsibility, two suicide bombing attacks were carried out against the Afghan intelligence headquarters in the city of Kabul. One of the perpetrators, codenamed Kaaka al-Kurdi (suggesting that he was of Kurdish origin), carried out the attack with an explosive vest. According to the claim of responsibility, 50 people were killed and wounded. The survivors fled to the operations room, where another suicide bomber was waiting for them. The suicide bomber, codenamed Khalil al-Qurashi, then blew himself up (Haqq, April 30, 2018). On April 28, 2018, 20 people, including six policemen, were killed in Jalalabad by a motorcycle bomb near a mosque and an election registration center (Afghanistan Times, April 29, 2018). On April 29, 2018, the Amaq News Agency announced that 20 people, including six policemen, had been killed by a motorcycle bomb at a voter registration center in Jalalabad (Haqq, April 29, 2018). Five people were killed and at least 10 others were injured in a car bomb explosion on April 27, 2018, in the Helmand Province in southern Afghanistan. According to local reports, a suicide bomber blew himself up with a car bomb near the army headquarters. The blast killed four civilians and one policeman. No claim of responsibility has been issued to date (Ayn Libya, April 28, 2018). ISIS’s Khorasan Province released photos from the Mohammad Abu Masalma al-Ansari training camp where it trains its operatives. The photos show the operatives undergoing training, including in the use of small arms, and storming various targets (Haqq, April 28, 2018). In March 2018, the Russian Federal Security Service (FSB) thwarted the activities of four operatives belonging to a secret ISIS network. The operatives came from the city of Novy Urengoy, approximately 2,300 km northeast of Moscow (the second largest city in Russia’s Yamalo-Nenets province). The operatives planned to carry out a series of terrorist attacks in the Moscow region, under the direction of handlers in Syria. They received their instructions via the Telegram app. Their interrogation revealed the network’s ties with a number of other extremist residents in the city of Novy Urengoy. As a result, on April 26, 2018, the Federal Security Service, together with the Russian Interior Ministry, carried out an operation in the city of Novy Urengoy. They arrested 20 people and seized ISIS propaganda materials, communications devices and religious literature of a radical nature (Russian Federal Security Service website, April 27, 2018). This was the third time the Russian Federal Security Service foiled attacks planned by ISIS operatives in April 2018: On April 21, 2018, the security service liquidated an ISIS operative who had planned to carry out a shooting attack and detonate an IED in buildings of the local government and the Russian Federal Security Service in the Stavropol Province. On April 17, 2018, the Federal Security Service announced that it had arrested operatives of an ISIS squad who planned to carry out a shooting attack and detonate an IED in the Rostov Oblast. The operatives were handled by ISIS operatives in Syria (Russian Federal Security Service website, April 17 and April 27, 2018). The connection between these networks and their Syrian handlers may indicate that even in light of the pressure exerted on ISIS in its core countries (Syria and Iraq), its operatives continue to encourage attacks around the world, including in Russia. According to Russian media reports, an Iraqi court sentenced 19 Russian women to life imprisonment for joining the Islamic State. Russian Foreign Ministry Spokeswoman Maria Zakharova confirmed in the past that the Foreign Ministry was aware of the matter and was in contact with the relevant authorities in Iraq. The Russian Foreign Ministry reported that since the summer of 2017, a total of 73 children and 24 women with Russian citizenship were sent back to Russia from Iraq and Syria. According to the announcement, some 50 to 70 women are being held in prisons in Baghdad (TASS News Agency, April 29, 2018). A senior ISIS official who served as ISIS’s Emir in Deir ez-Zor and who is close to Abu Bakr al-Baghdadi, was arrested along with three other senior operatives in the Izmir Province (Hürriyet Daily News; Anatolia News Agency, quoted by AP, April 27, 2018). The Euphrates Post website reported that the most senior of the four detainees was Kasser al-Hadawi, codenamed Abu Qa’qa’ al-Qurani, former governor of ISIS’s Al-Khayr Province. The three others held senior positions in the areas of intelligence and security in the Al-Khayr Province and in the Euphrates Province (Euphrates Post, April 26 and 28, 2018). On April 29, 2018, Turkish counterterrorism units arrested 10 people in the city of Adana suspected of membership in ISIS and planning an attack. Four of them reportedly have Turkish citizenship and six have Syrian citizenship (Daily Sabah, May 1, 2018). Turkish police in Istanbul arrested 41 people suspected of membership in ISIS. According to the reports, 40 of them are foreigners and one is a Turk (Daily Sabah, April 28, 2018). According to a report by Europol, on April 25, 2018, Western countries began an operation aimed at damaging ISIS capabilities to disseminate terrorist content. The United States, Canada and EU countries (France, Britain, Belgium, the Netherlands, Bulgaria and Romania) are participating in the operation. It should be noted that this week, two major ISIS websites – Amaq and Nasher – were removed from the Internet, but they might reappear within days or weeks. 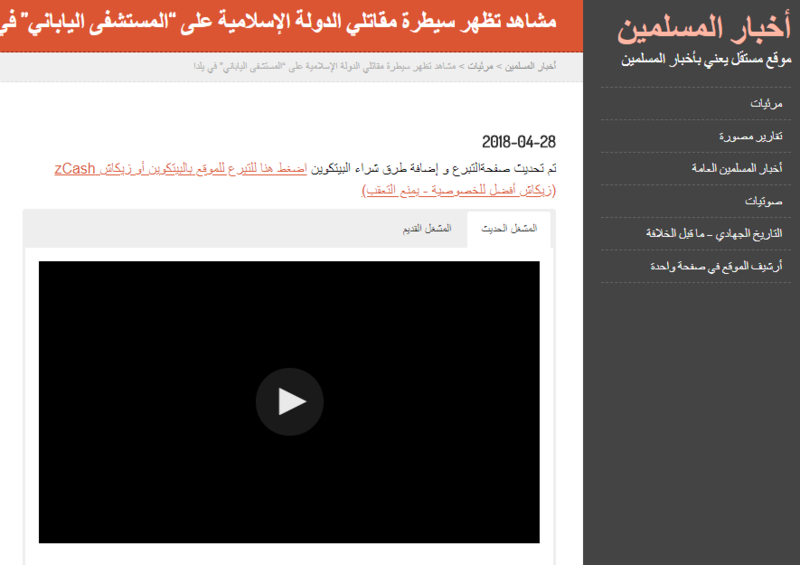 This week, ISIS’s important Akhbar al-Muslimeen website resumed activity after being down for a few weeks. The website has posted a call to donate to the organization, not only in Bitcoin (as was the case in the past), but also in an additional digital currency called Z-cash, which is considered more secure in terms of preserving the anonymity of those who use it.